For many kids trick-or-treating means a no holds barred night of indulging in sweets, but for kids with life-threatening food allergies biting into the wrong candy bar can mean a trip to the emergency room or worse. To make Halloween safer and more enjoyable for kids with food allergies, an organization called Food Allergy Research & Education (FARE) has started the Teal Pumpkin Project to alert parents and kids when a house is offering safe non-edible treats. FARE encourages communities to take part in the project by painting a pumpkin teal (the color of food allergy awareness) and placing it outside their homes before trick-or-treating begins. Those who take part can also display a free printable sign from FARE that indicates you are a house that can offer kids with food allergies an alternative to treats that often include known allergies like nuts, dairy, wheat, and so on. Their website also offers some ideas for inexpensive non-edible treats community members can offer kids with allergies like spider rings, bubbles, playing cards, stickers, bouncy balls and finger puppets. In order to spread the word about the Teal Pumpkin Project, FARE’s website also encourages and offers individuals a teal pumpkin badge to place on your blog or use as your Facebook profile. You can also print out some of their FARE flyers and place them in your neigbor’s mailboxes to try and get the whole community in on making Halloween safer for kids with life-threatening food allergies. 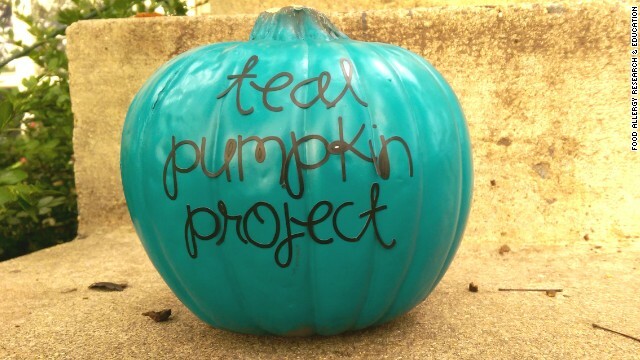 What do you think of the Teal Pumpkin Project? Do you think this project will catch on in your community? Would you be willing to take part in this project?